I Love use Binary formats, instead of XML, and JSON. Here is my Generic Binary Format for data transmissions or serializations. Data is composed by three blocks. The first one 1byte that describe all information about the object, like "is a single Int object" or "is a list", then tells you the second block length. 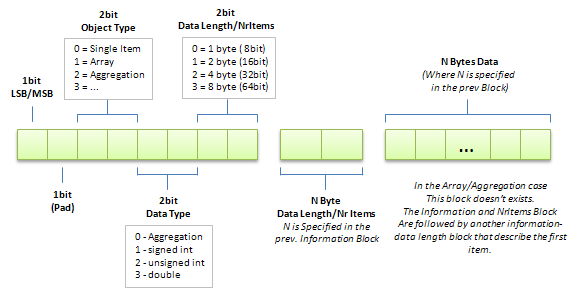 The second block contains the size of the third block (The Data-Block) or the Number of Items in List.